SRDC is partnering with Microsoft and 4-H for the Digital Ambassadors a 4-H Tech Changemakers Project to empower youth to help close the broadband internet gap. This partnership will elevate teens as teachers to provide training and communication to assist adults in their community with increasing their comfort level in utilizing new technology. This will allow the adults to truly adopt and use technology to improve their opportunities and outcomes. The effects of this work will be felt in education, workforce development, and community sustainability. In addition to programmatic training, the youth leaders will be trained as spokespeople to lift up and expand the youth voice in this critical conversation. The goal is that their experiences, as well as hopes and dream for their community, are heard. A new report from the Brookings Institution’s Metropolitan Policy Program, “Countering the Geography of Discontent: Strategies for Left-behind Places,” provides recommendations to improve outcomes of economically struggling regions. These include: boosting digital skills; ensuring businesses in lagging regions have access to capital; reducing gaps in broadband; identifying “growth poles” that can support regional growth; and helping Americans move toward opportunity. Across the United States and in Georgia, the number of small- and medium-sized farms is declining, and the average age of farmers is on the rise. Although we need new farmers, the barriers faced when trying to grow new agricultural businesses from the ground up can be formidable. In response to this need, the Journeyman Farmer Certificate Program was developed by the University of Georgia Cooperative Extension and its partners to provide a comprehensive training program for beginning farmers. This project is funded by USDA NIFA Beginning Farmer Rancher Development Program. James Morgan, County Coordinator and Agriculture and Natural Resources Agent, implemented the effort in Dougherty County which was selected as a host site for year two of this grant funded program. In order to offer a variety of farm business and production trainings, James invited other county agents and extension specialists to share their expertise with participants on topics such as soil health and fertility, fertilizer and amendments, cover crops, groundcovers for small fruit, crop rotation, pest management, pesticide safety, crop selection, seasonality, vegetable propagation, seeds, transplants, small fruit production, equipment and tools, drip irrigation, tillage, post-harvest handling, food safety, marketing and crop plans. Twenty-eight people from 12 counties participated in part one of the Journeyman Farmer Certificate Program in Dougherty County which focused on small farm business planning. Only 18 of those 28 participants indicated that they were currently farming. The other ten had a desire to start a farming operation but had not done so at that point. Part two of the Journeyman Farmer Certificate Program focused on small fruit & vegetable production or small ruminants production. Nineteen people from eight counties participated in part two of the Journeyman Farmer Certificate Program in Dougherty. Thirteen of those19 participants indicated that they were currently farming. The other six had a desire to start a farming operation but had not done so at that point. "Many of the young people interested in farming don't come from a farming background," said Julia Gaskin, director of UGA's Sustainable Agriculture Program. "We have been very interested in developing a comprehensive training program to help this group and those currently farming that want to improve their operations." Other Georgia counties participating in the Journeyman Farmer Certificate Program include Screven County, Carroll County and metro Atlanta. Georgia Organics is leading the Hands-on Training for farmers interested in small fruit and vegetable production that will offer internships and/or mentoring experiences. The University of Georgia, College of Agricultural and Environmental Sciences, UGA Small Business Development Center, Georgia Organics, the Georgia Fruit and Vegetable Growers Association, Fort Valley State University and AgSouth Farm Credit, along with other partners, are developing the training and mentorship program to help beginning farmers become sustainably successful farmers. James Morgan is a native of Orangeburg, SC. He earned a Bachelor of Science Degree and Masters in Agricultural Education from Clemson University in Clemson, SC. Before moving to Georgia, James spent two years working as a County Extension Agent at South Carolina State University 1890 Extension Program in Orangeburg. He joined University of Georgia Cooperative Extension in March 2000. As a County Extension Coordinator in Dougherty County, James has provided leadership in the urban horticulture program, 4-H livestock program, as well as the commercial industry in row crops and pecans. James coordinates a Master Gardener Extension Volunteer program, conducts educational programs for homeowners and the landscape industry and facilitates production meetings with UGA specialists for farmers. James is well-known for educational outreach to beginning farmers, coordinating the Journeyman Farmer Certificate Program in southwest Georgia. This project is funded by USDA NIFA Beginning Farmer Rancher Development Program and includes three training steps: small farm business planning, small fruit & vegetable production or small ruminants production, and hands-on production training. Mr. Morgan educates those interested in starting a farm business or those who have recently begun or have been farming less than ten years and want to improve their operations. He partners with the Small Business Development Center of the University of Georgia so that new farmers understand market feasibility, balance sheets, income statements, risk management, marketing and technology, as well as preparing a business plan. James recognizes that developing the next generation of farmers is extremely important for the sustainability of agriculture. 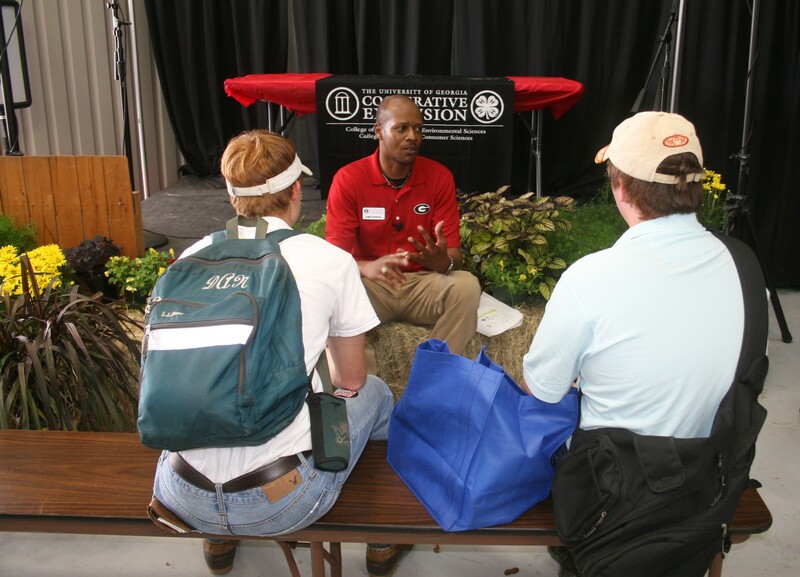 Photo: James shares expertise in agriculture with farmers and homeowners at the Sunbelt Ag Expo in Moultrie, Georgia. The University of Kentucky Department of Community & Leadership Development (UK-CLD) seeks candidates to fill a tenure-track Assistant Professor position in Community-Engaged Research in Community Development. UK-CLD is a multidisciplinary social science unit within the College of Agriculture, Food and Environment (CAFE), with a mission to strengthen the capacities of individuals, organizations and communities to act on their shared visions and challenges. The successful candidate will initially divide his/her efforts among research (55%), instruction (40%), and service (5%). The conference Keynote Speaker will be Grace Gorrell who is a former faculty member at the University of Kentucky. Since retiring she has begun a business "Leading with Grace". "The Magic of Small Business"
The goal of the Community Food Systems Program annual event is to engage, support, and inspire individuals from all areas of Iowa’s food system in conversation about community food systems. Workshop topics may include technical support on starting school gardens, food hubs, or shared use kitchens, sharing educational materials, feasibility of new businesses, and general programming ideas. April 16-19, 2019, Registration now open! The National Urban Extension Conference is the only national gathering of Extension professionals who serve our cities. The 2019 conference, “Innovation in the City: A Land Grant University Experience”, will highlight strong urban programming and Extension’s opportunity to support the university-level mission of our land-grant universities in our metropolitan regions. With urban focused sessions, mobile tours, networking opportunities, social events, and exhibits the conference aims to both educate and inspire. November: Does Extension Need Highly Visible Educational Programs Beyond the Farm, Familes and Youth?